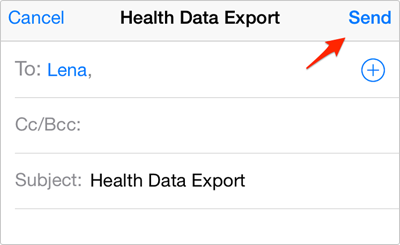 How to Export Health App Data on iPhone in iOS 9 -iMobie Inc. If you are looking for the method about how to export Health app data on iPhone in iOS 9, this guide will tell you the exact answer. Go to download AnyTrans to manage your iPhone data after reading this guide on how to export Health app data in iOS 9. Health App is one of the best inclusions by Apple. It was first introduced with iOS 8, and there is no doubt that it is also an awesome app for the newest iOS 9. It helps collect various types of information about your health like steps, weight, heart rate, blood pressure, sleep analysis, hormones, proteins and many more. You can enter data manually, and you can also use various third party health related apps to collect the data for you. Sometimes, you may lose your Health app data because of failed iOS upgrade, restored a backup, or other unexpected reasons. So you may want to export the Health app data as backup just in case. But how can we make it? Keep reading the following part to find the exact answer. Step 1. Open the Health app on your iPhone. Step 2. Tap Health Data on the bottom > Tap on All. Step 3. Tap on the sharing icon on the top right corner > Tap on Export in Popup. Step 4. Mail it to yourself. (You should first configure your email account under Mail app). Note: If you want to have a full control of your iPhone data, you can have a try on AnyTrans. It would be your best choice by allowing you to transfer, backup, and remove content on your iPhone easily. If you just upgrade to the newest iPhone 6s (Plus), you may want to know how to transfer data from old iPhone to the new iPhone 6s. And you should also know some tips to maintenance your iPhone 6, so that it will be functional and useful for a long time.